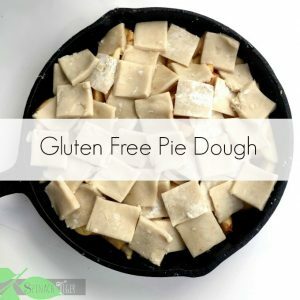 This is my recipe for gluten free pie dough, more than enough for pan dowdy or double crusted pie dough. 2½ cups Bob's Red Mill 1 to 1 gluten free flour (order here). Cut butter into small pieces, freeze for 15 minutes. Add just enough iced cold water to bring together. Pulse in food processor. You will see dough form. Pour into a plastic bag. Seal.